The antique Italianate colonial house at 931 Old Post Road was once the home of celebrated 20th century artist Robert Vickrey. FAIRFIELD — Celebrated 20th century artist Robert Vickrey (1926-2011) specialized in the ancient medium of egg tempera, which he used to create his noteworthy work. His paintings are included in the collections of 80 leading museums, and his portraits graced 78 covers of Time magazine between 1957 and 1968, according to his website. One of his most notable portraits was of the Rev. Dr. Martin Luther King Jr. for the magazine’s Man of the Year issue in 1964, according to Vickrey’s obituary in the New York Times on April 20, 2011. Vickrey’s style, “magic realism,” may explain his attraction to the symmetrical antique Italianate colonial house at 931 Old Post Road, where Vickrey lived and painted for a number of years. It is a magical blend of past and present. The Samuel A. Nichols House was built circa 1850, and it was more recently renovated and expanded to 4,936 square feet, preserving many of its 19th century architectural details and adding many special features appropriate to the current century. Among its historic and distinctive features are its decorative brackets under an ornamental cornice on the front facade, cross-gabled roof, its tall ceilings and windows, and its spacious covered front veranda with several sets of double columns. “This style dominated American houses, in both urban and country settings, between roughly 1850 and 1870. The style was popular as cities and towns were settled across the Midwest, making Italianate a common sight in such places. It was also popular in the still-growing older cities of the Northeast,” according to the website architecturestyles.org. Among its modern-day features are the deep crown moldings, cherry-paneled library, the new designer kitchen, and in-ground swimming pool and spa in the very private backyard, despite the home’s in-town location. It is within walking distance to many town amenities, including the Fairfield Public Library less than a block away, Metro-North train station, shops, downtown restaurants — including some that are Zagat-rated, Roger Sherman Elementary School, the YMCA, the Fairfield Museum and History Center and Penfield Beach. 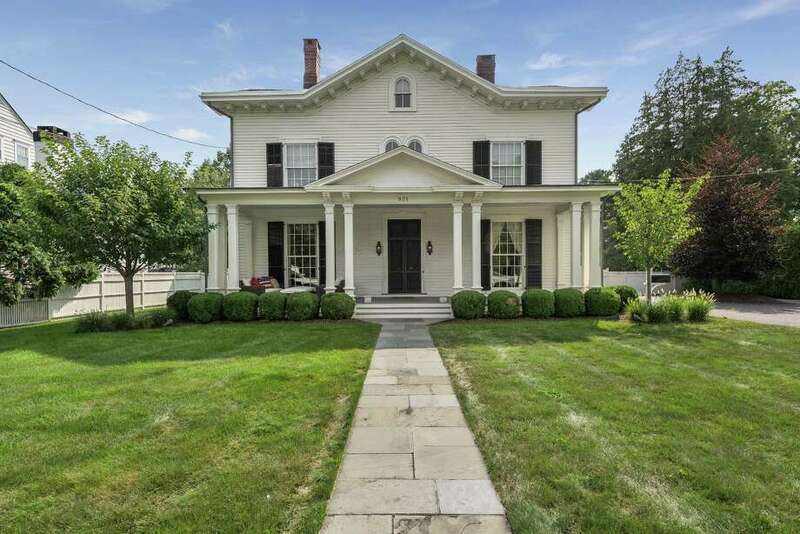 The white clapboard house with black shutters sits on a 0.62-acre level property behind a white picket fence with a gate to a path that leads to the front veranda. Another gate opens to the circular driveway, which provides ample off-street parking and leads to a second gate into the backyard, the pool, attractive gardens, and the detached, oversized three-car garage. Open the French front doors with beveled glass panes into the sizable foyer, where there a large powder room has basket-weave marble flooring, and nickel console sink with a marble counter. To the right of the foyer is the formal dining room, where there is a fireplace. To the left is a parlor, which also has a fireplace and grass cloth wallcovering. In both rooms on the walls facing the street the windows are almost floor-to-ceiling. The third fireplace, this one with a marble surround, is found in the family room, which also has two sets of French doors to the rear veranda. There is a built-in grill area on the veranda. In the cherry library there is a built-in desk area and bookshelves, and a coffered ceiling. A cafe-style door leads from the dining room into the kitchen, which features porcelain countertops, a two-tiered center island with a breakfast bar for four stools, glass-front cabinetry with interior lighting and other custom cabinetry, and walk-in pantry, and large farm sink. High-end appliances include a Viking Professional six-burner gas range top in the island, Viking double wall ovens and warming drawer. Off the kitchen there is a breakfast room and a mudroom with the first of two laundry facilities. The second laundry room is on the second floor, as are four of the home’s five bedrooms and an office. In the spacious master suite there is a sitting area, two custom walk-in closets, custom built-in cabinetry, and a luxurious spa-like marble master bath featuring a large glass shower, two vanities and a soaking tub. From the bedroom step up into a separate office or nursery, which can also be accessed from the hall. On the third floor there is another bedroom and a large room with flexible use including as a recreation or game room. This floor also has a full bath. In the full unfinished basement there is a lot of storage and one area would be ideal to transform into a wine cellar.